After skating for most of the season, Old Man Winter showed up with a shovel and has proceeded to bury us. So far, several areas have reported record snow falls including my home town of Asotin. For those of you that scoffed when my sweetie bought me a snow-blower, HAH! The Snow Joe has earned its keep this month. The view from the roof at an inspection in Pullman. Also happening this month - business is picking up. This time of year gets pretty treacherous for walking roofs, though sometimes it can be done. It requires a careful consideration of the underlying structure of the snow and of the point of access, but snow by itself is not a primary limiting factor. What is a primary limiting factor is ice. And, by golly, we are seeing a lot of ice on the edges of roofs lately due to ice damming. In its simplest form, ice damming is a build up of ice on the eave of a roof. The formation is from snow melting at a higher point on the roof, typically over the heated portions of the home, and flowing down the roof slope to the eave. The eave is at nearly the same temperature as the air outside. As the water hits this frigid zone, it re-freezes. In the process, the dam blocks more water from flowing freely off the roof deck, thus extending the ice dam. Because the velocity of water drainage plays a part in the process of re-freezing, lower slope roofs are more susceptible to ice damming. On a low enough slope, the ice can build up many feet along the roof deck. That is what I found with the roof in the second picture. My best estimate is that the ice extended 8-10 feet up the roof from the edge. The presence of the ice is not the major cause of damage to the home. While the accumulation can cause problems, it is the water behind the dam that causes the most concern. Our roofs are not designed to act as pools and are not water-proof. They are water shedding. That is a huge difference. Obstructed water will not drain down the roof. Water being water, it will try to find a way to flow with gravity. This means flowing under the shingles, finding gaps in the underlayment, and getting into the ceilings and walls of the home. It is not just a matter of getting a roof stain on your ceiling, though. This moisture in your attic can be a major contributor to the growth of mold and wood destroying fungus. Ever drive by a house and admire the long glittering icicles hanging from the roof? Well, admire those from a distance. If you see those on your house, you likely have an ice damming issue. Likewise, if there is a four inch iceberg on the edge of your roof, you’ve got a problem. Also, a couple people a year get killed by falling ice or icicles from a roof.Do not walk right under the icy spears admiring them. If you are walking around a house with ice on the roof, stay near the wall under the eave or well clear of the fall zone to the perimeter. Just a heads-up - if there is ice at the edge like this, I’m not getting on the roof. There are other factors that come into play. If you have canned ceiling lights, they can create enough heat to cause problems. Have a contractor insulate the boxes. Check to make sure that you have enough effective attic ventilation. If you do not, the attic will retain warm air and lead to ice damming. Also, to mold growth. 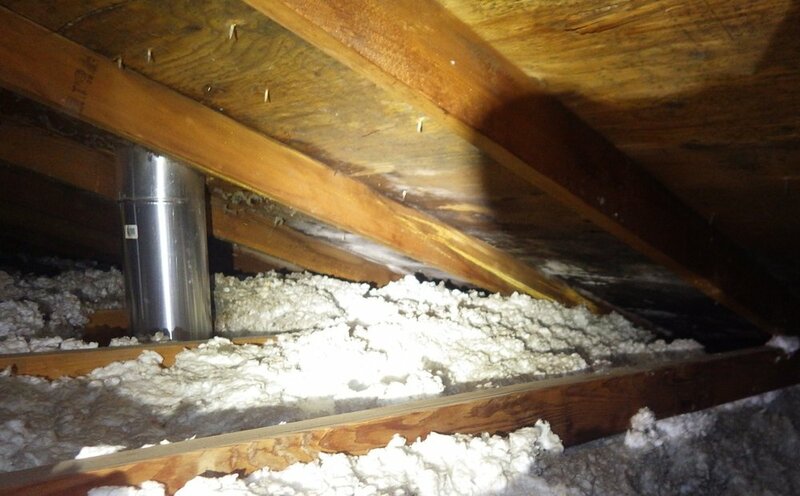 If you have a furnace in the attic, make sure all the joints in your duct work are tight. Leaky ducts will cost you in more than dollars. Insulate all your ventilation fan ducts. Bathroom fans and dryers move warm air to the outside. If they pass through the attic on the way, they will transfer much of their heat to the attic space. Insulate them and limit that possibility. If these steps do not work to control your issue, it is time to call in a quality contractor to perform a thorough analysis of the heat transfer taking place, including thermal transfer through air exfiltration from ceiling penetrations or up the wall cavities. Good luck! As always, if you have questions, feel free to call. I may have a tidbit of information that can help. I’ll leave you with one more scary picture . . .
Water is actively leaking and two different fungi are growing.